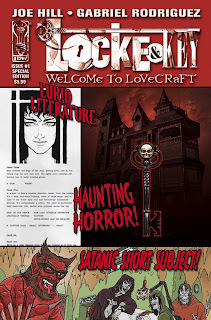 In September, we're releasing a Special Edition of the first issue of LOCKE & KEY: WELCOME TO LOVECRAFT. This is the start of the entire Eisner-nominated story, the full 32-page comic that kicked off the series. But what's more special about this is the fact that we're running the original Joe Hill script behind the story. And even more notable than that is the bonus story we're running in the back. The 72-page issue will also include a 10-page back-up story (unrelated to L&K, a fun standalone tale) by Joe and the late Seth Fisher, "Freddy Wertham Goes to Hell." This was one of the first things Joe wrote in comics. It was originally created for Cemetery Dance's GRAVE TALES comic, but they were nice enough to let us run it here, in color for the first time. 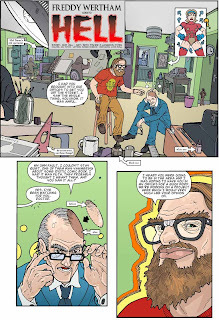 Fisher's former studiomate, artist Langdon Foss, finished the last pages and worked on the colors with Jay Fotos. So it's a great last showcase of Fisher's amazing talent (and that Hill guy did a decent job on it, too). Seth Fisher was an absolute star and is still missed. Looking forward to picking this up! Seth Fisher was shockingly talented. Can't wait to see this story. The drawings for this story were intended from the beginning to be a collaboration between Seth and his good friend and often-partner Langdon Foss. Seth was going to block out the pages, Langdon to do the pencils, and Seth would finish by doing the inks. As it was, Seth blocked out the pages, but then he died. Langdon did both the pencils and inks. Langdon never had as much comic book work as Seth, but his art is stunning! I just didn't want people to think that this story is all Seth; really, it's mostly Langdon. But because Seth and Langdon knew each other so long (since 1991), and worked together and encouraged each other, and challenged each other to greater heights from their artistic beginnings until Seth's death (and I wouldn't say it really ended there), both their work is contained in the work of the other. I think Langdon and Seth would both agree with this assessment.